1 juni, 2013 Säg något! A while ago, I reported about a rumor that there perhaps was a Tales of Symphonia HD Collection coming. And that it would include Tales of Symphonia and Tales of Symphonia Dawn of The New World and today this pack was announced to be true!! 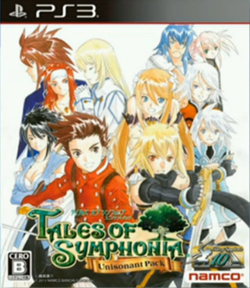 This collection will be called Tales of Symphonia Unisonant Pack and will be released October 10th. This was all announced just right now in an event in Japan called Tales of Festival. Right now I am so very hyped! I actually cried a little bit when I saw this announcement, guess that just proves to me how much I really liked Symphonia. Well it was my first Tales of game and it sure was love at first sight. The opening song too Tales of Symphonia “Starry Heavens” will be getting a new version, a 2013 remix if you will. Same with ToS2 opening song. And to top it of, as I was writing this we got confirmation that this collection will be released in Europe and America early 2014!! My god! This has been the best day of this entire week for me I am so goddamn happy right now. Long live the Tales of series!! It seems the collection will go under the name Tales of Symphonia Chronicles in Europe and America, a name I think is a bit better than Unisonant Pack or just HD Collection that some developers just call their HD versions.